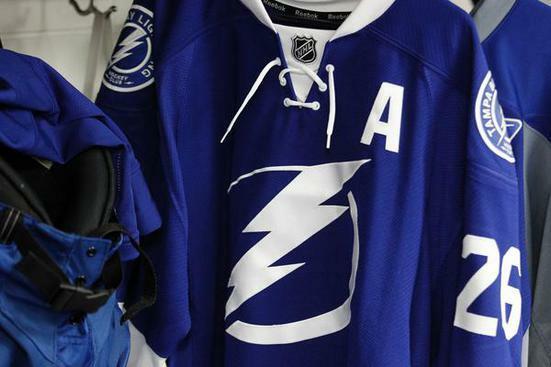 The Tampa Bay Lightning Leaf-style look is still great, despite more mixed reviews than a Super Bowl anthem singing. News sites, blogs and fan polls about the flash digs differ in their views with those in favour hardly overwhelming the detractors. I find this strange because the new jersey is all class. I’m no Armani but I don’t know how you could conjure something better – even with Giorgio himself leading the design team. Some fans are tough to please I guess. The two-tone uniforms with simplified lightning bolt logo hark back to another era. And that can only be a good thing. Let’s face it, the old jersey was caught in that early 90s design vortex that has hurt so many hockey team identities – as well as teen idols like Luke Perry and various R&B stars. General Manager Steve Yzerman and the club consulted strategic brand development firm SME to develop the new brand, with an emphasis on a “classic” and “iconic” look. And I think they succeeded. The blue and white incarnation is reminiscent of classic Maple Leafs uniforms, which hopefully for Tampa’s sake, inspires classic Leafs-like victories.